Location Nautic - Press review: Var Matin talks about us! Zoom on Location Nautic in the newspaper Var Matin! 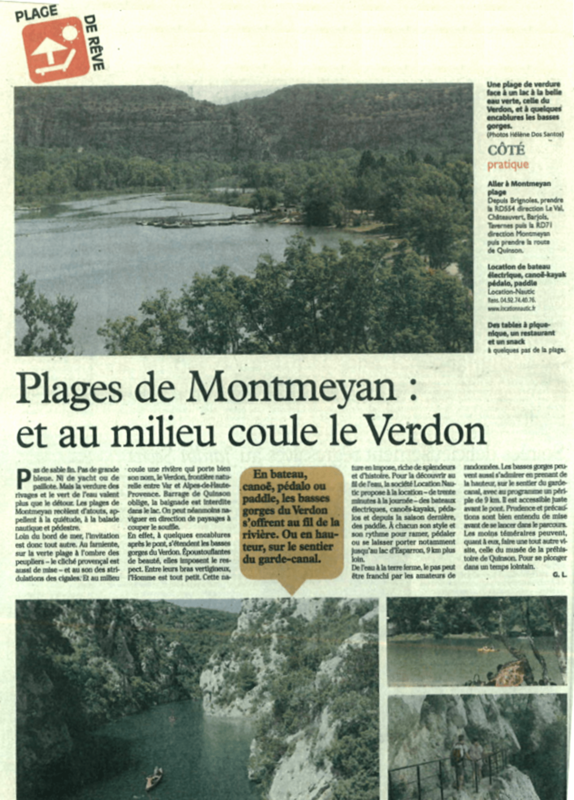 In an article published on July 14, 2017 entitled "Plages de Montmeyan: et au milieu coule le Verdon", Var Matin presents the fantastic site of the Gorges du Verdon. Between cliffs and preserved flora, the local newspaper was also interested in our nautical rental base of the Plage de Montmeyan. Rental Nautic to discover the Verdon "au fil de l'eau"
To admire the richness of this natural border between the Var and the Alpes de Hautes Provence, there are two solutions: hiking trails or the nautical stroll on the Verdon. It's definitely on the water that you can mostly realize the exceptional place in which you are. In the heart of the lower Gorges du Verdon from the Plage de Montmeyan, on the living artery of this place, "Man is very small" as said Var Matin. This is the ideal spot for a boat trip, canoeing, pedalo or paddle! At 9 km from our base, the daily newspaper also reminds you that you can access to the Lac d'Esparron and for history lovers, at the Museum of Prehistory of Quinson located in front of our site. Thanks to Var Matin for this article!